Dear Readers, In this post we providing SBI PO Previous Year Question Paper PDF with solutions along with some model papers. 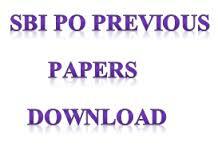 SBI PO previous year PDF includes SBI PO papers of 2015,2016 and other old papers. Candidates are advised to download these papers and practice them for SBI PO 2017 recruitment. Note- These papers collected from various sources from internet.